This article was originally published on The Australia Times and The Victress. McLaughlin dealt with Gayle's advances by not making eye contact and who can blame her? It's not as if one should be prepared for this type of pathetic behaviour. In elite sport, one expects more. I couldn't believe that I was sitting in my living room, watching a highly intelligent and successful female sports journalist being reduced to a piece of meat, in a live telecast. I thought perhaps in 2016 we may have evolved past 'caveman mentality' but obviously not. 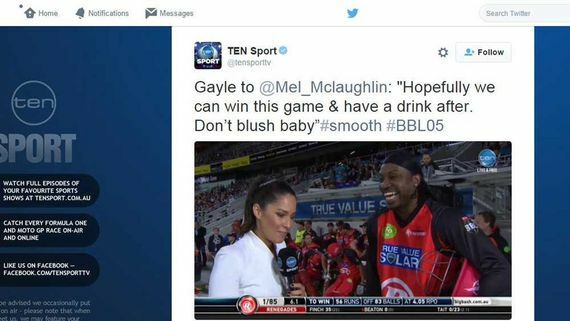 Ten Sport posted a tweet of the interview with the hashtag #smooth before later deleting it. I suspect in fear of public backlash. Why was that tweet posted in the first place? Here's a hashtag for you Ten Sport -- #disgraceful. Gayle gave a half-arsed apology whilst laughing before McLaughlin crossed back to the commentary team. A commentator is heard saying: "Playing shots on and off the field. Extraordinary Chris Gayle!" Sports commentator Mark Howard then (thankfully) criticised Gayle's actions, saying the West Indian batsman 'had gone too far'. One shouldn't have to pay a price for their gender but it seems sexual harassment of women in Australian television, media, politics and sport is alive and well. It's time to apologize publicly and with sincerity.